In October, we reviewed the Pennhurst Asylum Haunted Attraction, but tomorrow we return to Spring City, PA to experience Pennhurst Paranormal. A 6-hour Paranormal Investigation of the Mayflower Dormitory Building on the abandoned campus of the Pennhurst State School & Hospital . The Pennhurst Paranormal Association offers both private and public paranormal tours and investigations. Tickets are $125 each for the public investigations and $1,000 for private investigations. Care to join us tomorrow? Buy Tickets Now. Follow us on Facebook and Twitter from 9 PM – 3 AM EST to Live Chat and Receive Photo Updates during our 6-hour Paranormal Investigation. On May 25th, we will be participating in a private paranormal investigation at The Shanley Hotel in Napanoch, NY. This haunted hotel was built in 1895 after the original hotel (built in 1845) burned down to the foundation on March 18, 1895. The Inn is comprised of 35 rooms, a hidden basement room, secret passages inside closets, and a former bordello. We look forward to sharing our experience with you. Make sure to follow us on Facebook and Twitter to Live Chat and Receive Photo Updates on our Paranormal Investigation. Have you visited The Shanley Hotel? Tell us about your experienc in the comment section below. Read more about the history of The Shanley Hotel here. Book your own overnight stay and paranormal investigation for $85 per person. A Postcard of The Shanley Hotel from 1906. Nestled in the woods beside Spring City, Pennsylvania lies the remains of the Pennhurst State School and Hospital (originally known as the Eastern Pennsylvania State Institution for the Feeble-Minded and Epileptic.) The massive compound for the mentally and physically disabled was built in 1908. It was completely self-sufficient with its own power supply, dairy, green houses, fire department, movie theatre, and underground tunnel system. At the turn of the last century, it was thought best to segregate disabled individuals from the rest of society, but a 1968 exposé uncovered that over-crowding and under-funding had led to conditions that were unsanitary, inhumane, and dangerous. Ultimately, the Supreme Court found institutionalisation to be unconstitutional (Halderman vs Pennhurst State School) and Pennhurst was abandoned in 1987. We arrived in Spring City, PA late on Saturday night. The Victorian architecture of the town is lovely, but under the mask of darkness it takes on a very different aesthetic. We arrived at the address listed on the Pennhurst Asylum website and were directed to park in a field. Reaching Pennhurst requires a 10 min walk through the woods. Go ahead and read that last sentence again and really let it sink in. The buildings rise out of the woods and you are instantly transported to the early 1900s. Pennhurst Asylum is straight out of your worst nightmare. The haunt is made up of 4 separate attractions: ‘Pennhurst Asylum’ in the old Administration Building, ‘The Dungeon of Lost Souls’ explores the basement of the Administration building, ‘Ghost Hunt’ is a self-guided flashlight tour through two floors of the abandoned untouched remains of the Mayflower Dormitory, and ‘The Tunnel Terror’ a walk-through haunt located in a 900-foot section of Pennhurst’s underground tunnel system. There is a centrally located ‘picnic’ area with food and refreshments if you need to take a break. The Raven & Black Cat says: We agree! Fear is subjective, but the remains of the Pennhurst State School would be terrifying on its own. Pennhurst Asylum is a top-notch haunted attraction that can be placed in two very exclusive categories: A Real Haunted Location & The Actors Can Touch You. Visit Pennhurst on a Thursday or Sunday, or spring for the VIP Pass to cut the lines. Without timed admission, you could be looking at some outrageously long lines. Wow. There is a LOT to love here. The attraction entitled ‘Pennhurst Asylum’ is housed in the old Administration Building. You walk through the actual rooms of the historic building and greet deliriously dark staff and human experiments of the mad Dr. Chakajian. (A fictional legend, in which a mad Austrian Doctor houses his human experiments in abandoned Pennhurst buildings, was created in order to be sensitive to the history of Pennhurst.) Many of the rooms contain equipment and artifacts that were abandoned in the buildings in 1986. Animatronics and clever special effects are employed to distract you while actors grab at your ankles. The element of soft touching is very effective. It is quite unsettling to have your personal space invaded in a traditional walk-through style haunt. One girl even tried to stick her fingers in my ears! The ‘Ghost Hunt’ Attraction is what we wanted to do from the moment we set foot on the Pennhurst campus. The Mayflower Building was featured on ‘Ghost Hunters‘ and ‘Ghost Adventures‘ and was found to be a hot spot for paranormal activity. It is outrageously creepy. The walls are covered in graffiti from the vandalism years. The odd messages commingle with remnants of dormitory life in a state institution like an abandoned metal walker still labeled with a patient’s name and ward number. The energy of the building is heavy with human suffering and I honestly believe I would be in tears if I had to sit in there for an hour by myself. It is that scary. ‘The Tunnel Terror’ is another fabulously inventive attraction with gorgeous elaborate sets. The lagoon section, in particular, is amazing, but I couldn’t help but wish that I could see the walls of the historic underground tunnel system. Perhaps by accident, we caught a glimpse of the original tunnel through an open door that was propped open by a chair. The tunnel is something I could not dream up. It is real life horror complete with secret passageways. A fifth attraction walking through a portion of the original tunnel would be an incredibly scary experience. The attractions of Pennhurst Asylum are so detailed and effective that we were surprised that they didn’t capitalize on the opportunity for a large and definitive ending for any of them. Instead of building towards a memorable last scene, all of the attractions end very abruptly. Creating a unique and memorable way to exit each attraction would be the perfect finishing touch to what is otherwise a flawless, fun, and frightening experience. Pennhurst Asylum is a must-see. It is a chilling and effective haunted attraction masterfully combined with the horror of human history. $5 OFF All Tickets (Promo Code: ghost ) – CLICK HERE! 13Haunts Coupon: $5 Off Combo Ticket (Thurs. + Sun.) – CLICK HERE! Terror Behind The Walls is a walk-through haunted attraction located within the Historic Eastern State Penitentiary in Philadelphia, PA. Built in 1829, this massive stabilized-ruin is still one of the top 5 creepiest places I’ve ever been. A major addition for 2012 is, Detritus, a 7th attraction that adds an extra 5-7 min to the Terror Behind The Walls experience. Detritus is located behind the Greenhouse, and provides an opportunity to explore a section of the penitentiary that was previously closed to the public. The Raven & Black Cat says: Fear is subjective, but Terror Behind The Walls is a family-friendly event that is heavy on startle scares and probably won’t cause any lasting psychological damage. I can’t say the same for Eastern State Penitentiary. The costumes, make-up, and character development integrate seamlessly to create each of the detailed creepy characters lurking inside the prison. ‘Lock Down,’ the harrowing journey down cell block 12 and ‘The Infirmary,’ with its rusted deteriorating medical equipment (and decomposing staff) are chilling stand-outs two years in a row. The electrifying ‘grand finale’ of Terror Behind The Walls utilizes flawless misdirection and provides the perfect ending to a night at the penitentiary. Terror Behind The Walls has perfected the art of the thrilling family-friendly haunted attraction. In a manner similar to their family nights, which are targeted to younger children, we would love to see what would happen if they added a few special late-night events to make the experience even scarier. 10 minutes alone in solitary confinement, perhaps? Terror Behind The Walls has mastered the startle scare and uses it to create a truly family friendly event that is the perfect combination of creepy and fun. Last year, I called it the Disney Land of Haunted Attractions. I stand by that statement. Ticket prices vary by night. Anyone under the age of 18 must be accompanied by a parent of guardian. No children under the age of 7 are permitted on site. Ages 7 – 12 are encouraged to visit on Family Nights, held each Sunday until 9 pm. 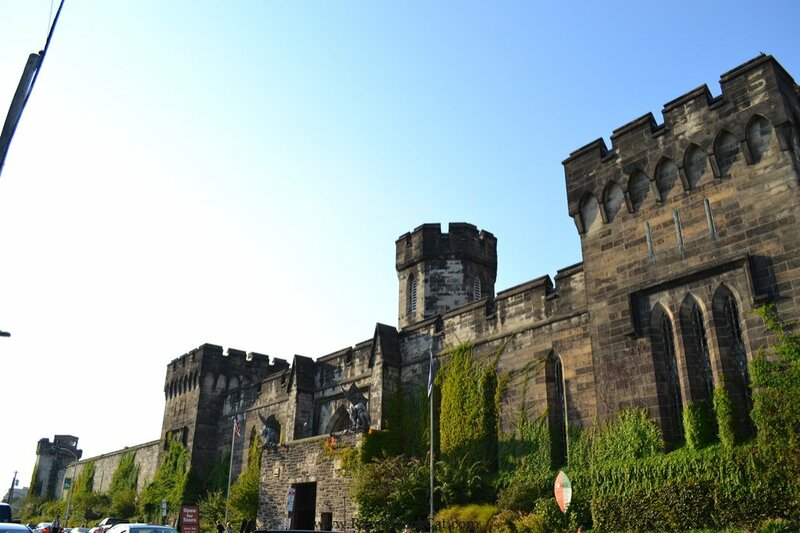 Check out the photo gallery from our daytime tour of Eastern State Penitentiary, while we put the finishing touches on our review of Terror Behind The Walls. UPDATE: Read our 2012 Review of Terror Behind The Walls.